You've decided to fundraise for your business. Now what? This is where the fun begins. This fun is called the Form C, which is an application required by the SEC (Securities and Exchange Commission) to disclose important facts about your company so your company can be verified for the investors. But first, let's grab a cup of coffee and go over the Form C together. It's really not as daunting or tedious as you'd think. And this guide will help you get through the Form C editor with ease and answer any questions you may have. What's your company's corporate legal name? What kind of a company is it? Choose either corporate or LLC. When was it organized? Tell us the exact date this company was organized. In which state was it incorporated or organized? How many employees are there currently? List all employees who are under the W-2 contract. Yes! The last question in this section. Who gets the job done in your company? Step 1. 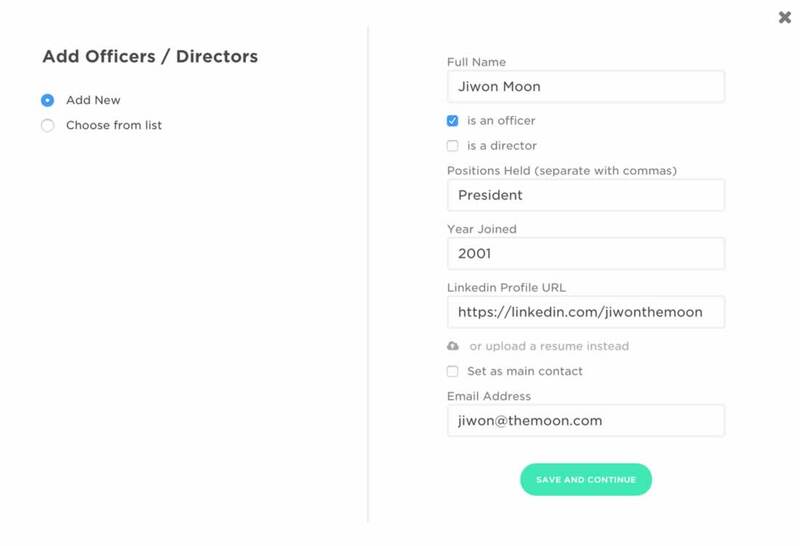 Make sure you add every officer and director of your company. Officers are defined as the President, VP, Secretary, Treasurer (or Principal Financial Officer), Comptroller or Principal Accounting Officer. If you thought naming officers was lame and didn't get official titles for your officers and directors, list the people who perform those roles. Step 2. You also need to provide 3 years of work experience in a LinkedIn profile, resume, or a bio for each officer and director of your company. Step 3. Take a look at this example to make sure you know what to expect! Remember to add every officer and director in your company. Step 4. Who are the principal security holders? Now that you've listed your officers and directors, it's time to tell us who owns a piece of your company. 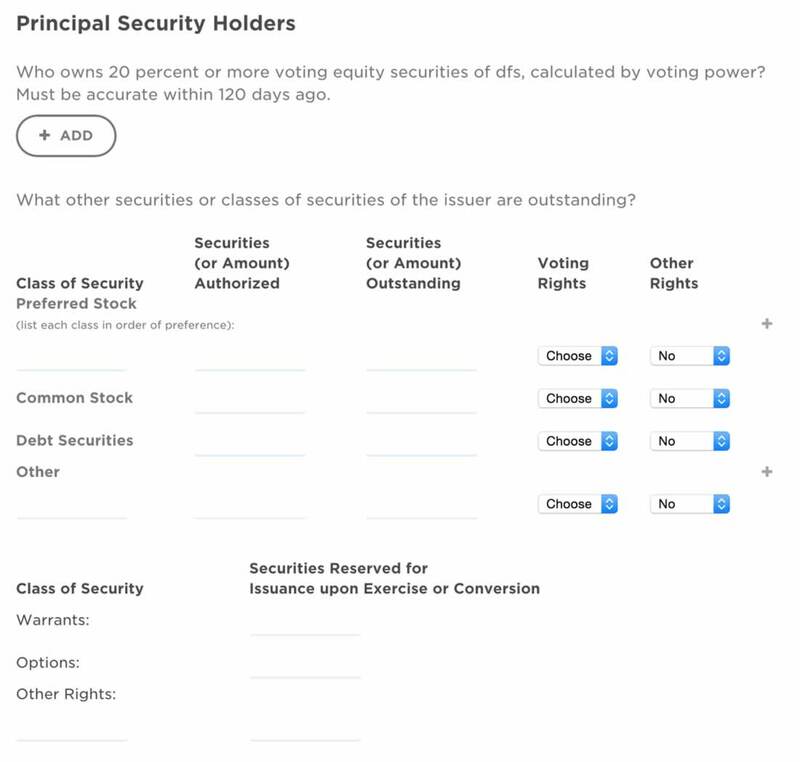 First, who owns more than 20% or more voting equity securities of your company (calculated by voting power)? Click the “Add” button to tell us the 1) name, 2) number and class of securities held by this person and the 3) percent voting power this individual holds. Let's get down to business and defeat the terms! Step 1. Set the Fundraise Terms. Step 2. Set Investment Perks. Perk, Perk, Perk, Perk, Perk! Think Kickstarter perks. Your investor has given you a chance to build out your next store, take your company to the next level, or start your dream business. It's time to give them perks for investing over a certain amount. This not only encourages investors to give a higher amount but it's also a way to thank them for getting you closer to your dream. For example, say I'm running a rocket company named The Moon. I am ready to launch my rocket into space for the first time. Now, it's time to disclose important factual information to your investors and the SEC. Step 1. First, disclose all the risks pertaining to your company. Don't be general, i.e. unpredictable weather. Be as specific as you can be about this particular risk that's unique to your company. Even if you're not sure, add it. Investors respect transparency and writing down the risks only protects you. Add at least ten bulleted risks- each a few sentences. Step 2. Now, it's time to disclose how you'll use the funds. Obviously, you can't be sure where every dollar will go. But you can estimate how you'll use the $100,000 you'll raise from your fans, grandma, friends and strangers from other countries. Set up different tiers that add up to your fundraise amount. Raising a minimum of $100,000? Tell us what you'll use the funds if you go over your minimum. Here comes the last step- disclosing your financials. Whether your business started yesterday and you have $0's in your financial statements or you've been running a business for 25+ years, you need to prepare GAAP- Generally Accepted Accounting Principles- financial statements of the last two fiscal years. What does that exactly mean, you ask? Step 1. Never heard of GAAP financials? Neither had I until I learned about the Form C. GAAP Financials include: your balance sheets, comprehensive income, cash flows, changes in stockholders' equity and notes to the financial statements. All five above are required by the SEC for you to submit the Form C via Wefunder. Balance Sheets: Total Current Assets, Accounts Receivable, Total Assets, Total Current Liabilities, Total Long-term Liabilities, Total Liabilities and Equity, etc. Comprehensive Income: Total Income, Total Cost of Goods (Sales), Total Expenses, etc. Cash Flows: Net Income, Cash at the End of the Period, etc. Changes in stockholders' equity: Notes the changes in the owners' equity during the fiscal year. Notes to financial statements: The notes report additional information left out in the main reporting financial statements. Step 2. If your offering (fundraise begin date) is in the first 120 days of the fiscal year, financials may be for the two fiscal years prior to the most recently complete year (unless they are already available). If your offering is after the 120 days of the year, you have to provide the last two fiscal years' worth of GAAP financial statements. Step 3. If your maximum fundraising amount is more than $100,000, your financial statements must be reviewed by a Certified Public Accountant (CPA) who is independent of the issuer and must include a signed review report. This public accountant must be: 1) duly registered and in good standing as a CPA under the laws of the place of his or her residence or principal office or 2) in good standing and entitled to practice as a public accountant under the laws of his or her place of residence or principal office. Step 4. Describe your financial condition (liquidity, capital resources and historical results of operations). Are there any known material changes or trends in your finances or operations since the time that your financials cover? Step 5. Describe your outstanding loans. Include the creditor, amount owed, interest rate, maturity date and any other material special terms. And... there you have it! Your Form C draft is done. Give yourself a pat in the back for getting through the Form C! We can't give you legal advice but we highly encourage you to have your lawyer read over this document to make sure you're not leaving anything out.